Moto Guzzi is known today for its long-legged and long-lived line of v-twin, shaft-drive machines. 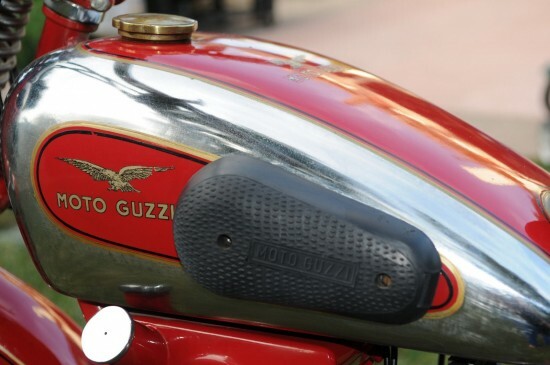 But before the introduction of their twin in the v700, Guzzi was famous for its successful line of horizontal singles. The Egretta [“Egret”] was a prewar model only made for two short years, and less than 800 were built before the improved Airone [“Heron”] superseded it. 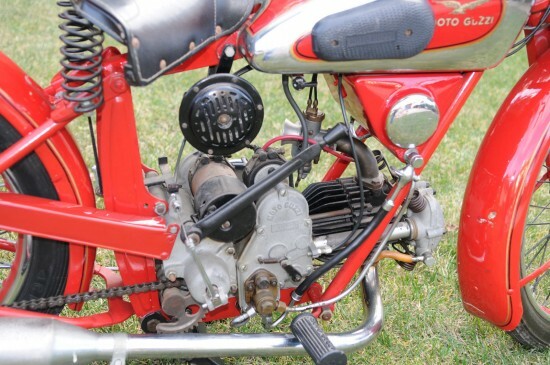 It lacked rear suspension and featured the 247cc single that would power the later Airone in various iterations until 1957! 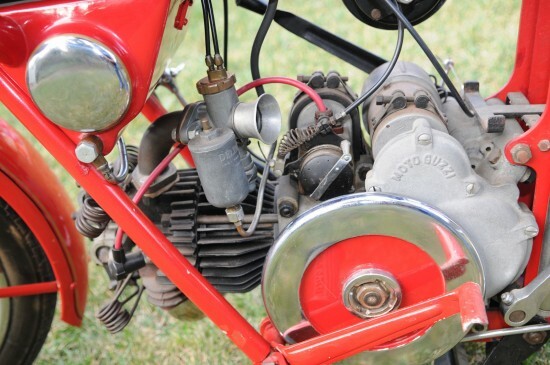 Although later models with this engine did have more modern, enclosed valvetrain, this early version features an exposed rockers and hairpin springs that are clearly visible in a number of the photographs, as well as Guzzi’s signature “salami-slicer” external flywheel. The “horizontal” single allowed for a very low center of gravity and excellent airflow to cool the engine. The exposed flywheel allowed the correct mass for rideability and performance, while keeping weight of the engine case castings low. This is a very special & very unique opportunity to own one of the rarest of the rare Moto Guzzi Vintage Classic Originals. Only made for TWO YEARS and only 784 EVER MADE, the pre-war 1939-1940 Egretta is the pièce de résistance for any Guzzi aficionado. It even has the original license plate! 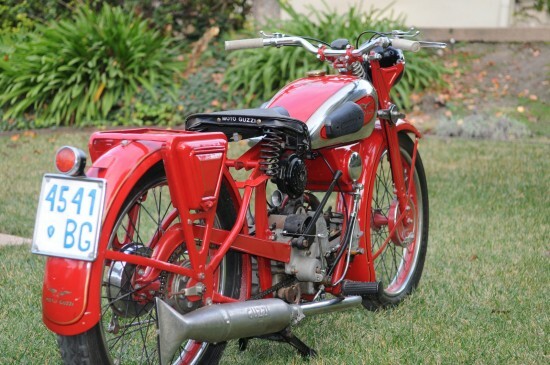 This gem is about as original as I can describe…and as you know, a bike is ONLY ORIGINAL ONCE. There are some paint nicks all over and some very minor dings on the mudguards, but the tank is straight. The chrome and paint are obviously 85 years old but remarkably intact for being that old. Previous owners have tried to cover up some nicks with paint here and there. There is nothing like riding a motorbike this old and this Egretta runs well. However, don’t plan on breaking any speed records. 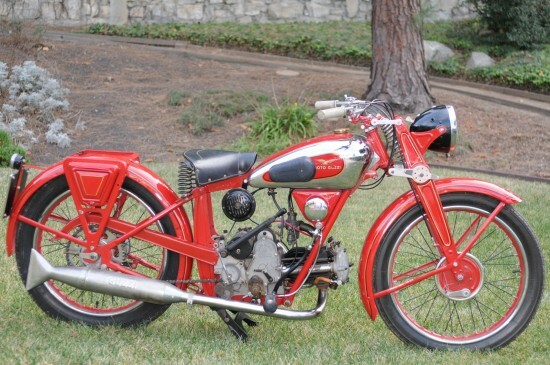 As the listing mentions, you may not be winning any top-speed contests on this, but the Guzzi’s famous flexibility should make it fun to ride within its modest limits: the singles were famous for their roadholding and locomotive torque, which made them competitive on both road and track. They can chug happily along in top gear at nearly any speed, making gear selection virtually superfluous. 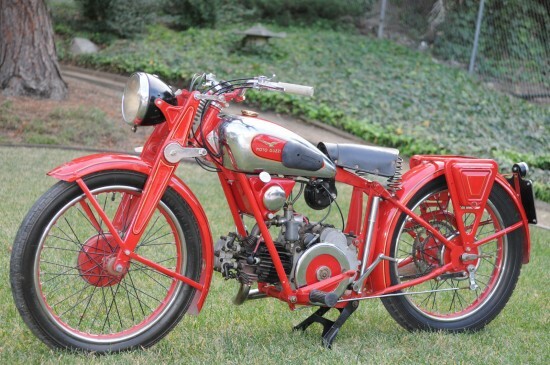 If you’re looking for something very rare for your collection in original condition, this might be your ride.